Pontus Carlsson has quite story to tell. Those who have never heard his story will be intrigued. Carlsson was born December 18, 1982 in Cali, Columbia, but tragedy struck him early in life and would change the course of his life. At the age of one, Carlsson lost his entire family and was adopted by a Swedish couple at the age of one. Sweden is a long way from Columbia, but it is the place where he would develop into an international star. While there is some ethnic diversity in Sweden, there are few Latin Americans and even fewer of African descent. Young Pontus currently holds duel citizenship… Swedish and Columbian. Of course, Pontus' life has been shaped by his present environment, but he has embraced his Latin American and African roots. Now fluent in Spanish as well as English, German and French, Pontus has ascended to the highest heights of international chess by earning the title of International Grandmaster. Young Pontus was taught chess by his adoptive father at the age of four and has represented Sweden in international competitions since he was a youth. His first international tournament of record was the under-10 European Championships in Rimavska Sobota. Emmanuel Berg also played in this tournament (under-16) and would become one of Carlsson's closest chess friends. Carlsson has spent most of his chess career traveling throughout Europe. He had scored some impressive results such a winning the Swedish Tusenmannaschacket Rapid tournament three times becoming the only player in history to do so. He had also won a number of youth championships at the national and regional level, but never enjoyed the same success in the European Youth Championships. He was also young enough to remember many top players when they were making their ascent in the junior ranks! "Although I mostly did good in those (coming in 6th three times), players like (Levon) Aronian, (Lazaro) Bruzon, (Alexander) Grischuk and Paco Vallejo were simply much stronger than me then… and they still are," he stated. 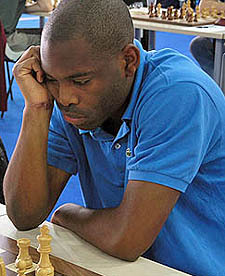 Carlsson also participated in international junior tournaments and once played Zambian Amon Simutowe in the 2001 World Junior. He played in his first national championship in 2001 at age 18, but really did not begin to apply himself until 2004. 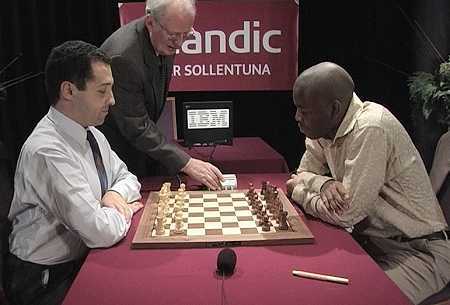 Pontus Carlsson facing GM Evgenij Agrest in a televised rapid match called the "Power Chess Tournament." Photo by Jonas Eriksson. "Before that I only played two or max three ELO tournaments per year. Between 2001 and 2004 I had problems to reach my normal playing strength during the tournaments since I was to rusty all the time. I always started the tournaments bad and then when I got warm and recovered, the tournament was over and it was a half year left to the next one. I had 2400 in 2001 and in 2004 I had 2360 after losing five ELO points in almost every tournament that I played during this period. Therefore I decided to activate myself and start to play more and a bit more serious." "The training that I have done this far have taken me to 2500, but in order to reach 2600 I need to work hard on my weaknesses." When asked if international opponents are surprised when placing his name and country with his face he quips, "No I don't think so. I mean there are only two black GMs in the world and I'm the only one that plays in Europe so everyone knows who I am. It's not possible for me to hide!" That may be certainly true in Europe, but there is no doubt that he must have fooled at least a few people during his international competitions. Pontus Carlsson has represented Sweden in several European Team Championships with his club, Sollentuna and represented Sweden in the 2006 Olympiad in Turin, Italy. Carlsson's rise to the Grandmaster title was rather sudden as he earned the International Master title in 2005 and after earning four GM norms, he was awarded the title in 2007. He recently scored a strong result at the recent European Team Championship scoring a 2686 performance. Carlsson at 2006 Olympiad in Turin, Italy. Photo by Daaim Shabazz. "It was really frustrating since I had scored four GM-norms and also passed 2500 but because of other peoples mistakes I didn't get the title. Unfortunately I let it affect me too much and I had a really bad period until I finally got the title. When I got it after the 3rd round in the European Club Cup I started to play much better and now I'm back over 2500 again." Carlsson plans to undergo serious training in an effort to reach 2600. He told The chess Drum, "The training that I have done this far have taken me to 2500, but in order to reach 2600 I need to work hard on my weaknesses." He states that both Dvorestky's Endgame Manual and New in Chess magazine are both part of his training program. Carlsson also plans to add Russian to his lingual library since there is good chess literature that is only published in that language. 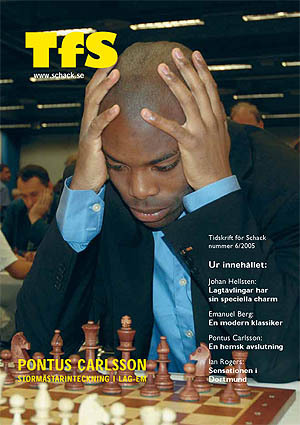 Sweden is a small, stable country and by Carlsson's admission, has a small chess community. However, the country has produced 16 Grandmasters including some legendary names such Ulf Andersson and Pia Cramling who was one of the first female players to be granted the Grandmaster's title. After becoming Sweden's 16th Grandmaster of Sweden, Carlsson received some congratulatory remarks from his Sollentuna Club, the Swedish Chess Federation and other chess players. He added, "The big celebration will be next year when I will be elected into the Chess Academy." The Chess Academy is an organization of dignitaries and sponsors of chess. All Swedish Grandmasters are members. "It would also be nice to attend once at some event arranged by the Hip-Hop Chess Federation since I'm a big hip-hop fan." What does the future hold for Carlsson? The newly-minted Grandmaster plans to travel abroad to compete and has sites set on the U.S. and perhaps tournaments in Dubai. Sponsorship is very difficult to attract in Sweden and it is with some hope that his status as a Grandmaster and membership in the Chess Academy will earn him increased sponsorships and invitations. He also has hopes to visit his native Columbia in the future and has mentioned participation in a Hip-Hop Chess Federation event given his love for the musical genre. Ironically, the young GM is not keen on blitz chess (3-5 minutes) although he is known for being a rapid specialist. "I think it hurts your chess to sit there hour after hour and just blitz out moves without any deeper thoughts. At internet most people just play for tricks and traps and suddenly they play in the same style in a normal long game," he reasoned. Next month, he will play three open tournaments in order to prepare for the big challenge in January when I will play in the C-group in Corus Wijk ann Zee. "I hope to do well there in order to start my march towards 2600." His fans will certainly be watching. 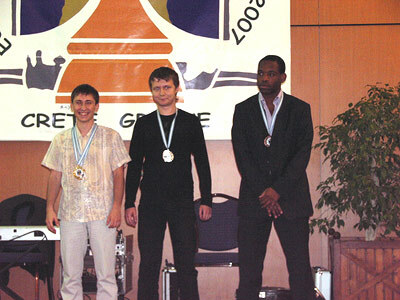 2007 European Team Championships: 5th board medal winners, Dmitry Jakovenko (Russia - Silver), Alexander Areshchenko (Ukraine - Bronze), Pontus Carlsson (Sweden - Gold) Photo by greekchess.com.